2. Scissors Beak - also known as Crooked Beak or Lateral Beak Deviation - is a condition where the upper beak is not straight and does not meet correctly over the lower beak. This is most commonly seen in cockatoos and macaws, but can occur in any species. It is rarely seen in parent raised birds and it is thought that parents may assist beak development by locking onto the rhinotheca when feeding the chicks.Several theories as to what the cause of this condition include improper artificial incubation or feeding techniques, heredity or, if developing over time, improper nutrition. The avian vet may trim the upper beak, cutting off the tusk and reshaping both the upper and lower beak. 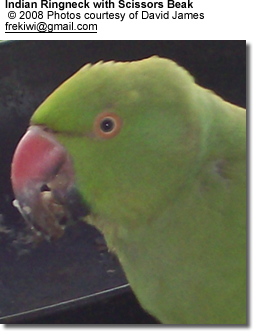 Persistent trimming will eventually result in both upper and lower beak growing normally. Incorrect trimming may worsen the condition. This should only be undertaken by someone skilled and trained in this procedure. This condition may sometimes be corrected with an acrylic appliance. In some cases, surgery may be necessary. Keratin normally migrates rostrally along the surface of the beak and laterally from the vascular bed. Any change in the rate of keratin migration between these two sites, any change in the premaxilla that changes the orientation of the tip, or a malformation of the frontal bone could cause the beak to deviate laterally. Correction procedures are designed to change the forces that direct the anterior growth of the rhinotheca (Figure 42.34). Redirected growth is achieved by applying a prosthesis to the lower beak on the affected side or by placing pins in the calvarium and using rubber bands to apply pressure to the tip of the beak (similar to orthodontic techniques used in humans). The prosthetic device must be sufficiently anchored to the lower beak to prevent normal beak occlusion from dislocating the prosthesis. The keratin of the gnathotheca on the affected side is grooved with a Dremel tool. The grooves should be deep enough to increase the surface area for prosthetic attachment but should not be so deep as to induce hemorrhage. The scored gnathotheca is cleaned and disinfected, and a light coat of cyanomethacrylate is applied to the area and allowed to dry. Stainless steel or nylon dental screen mesh is molded to the gnathotheca. The mesh should be extended to create a ramp that redirects the beak tip to the midline with each bite. The ramp is covered with cyanoacrylate and smoothed with a Dremel tool. When the defect is corrected, the implant is removed. This condition occurs when the tip of the rhinotheca rests on or inside the gnatotheca. This is most commonly seen in cockatoos. It is rarely seen in parent raised birds and it is thought that parents may assist beak development by locking onto the rhinotheca when feeding the chicks. This condition may sometimes be corrected with an acrylic appliance.